Writing often and gaining critique just as often. A writing community for anyone - write big, write small, whatever works for you. I post at least seven prompts at once and then for the rest of the week you write to the prompts. Write whatever you want - poems, drabbles, ficlets, anything you want. Longer works are welcome, but shorter works are preferred. Post what you write when you want to post it, and don't worry about deadlines - if the new prompts go up before you're done, just post 'em and mention what week they're from. 1. Prompts go up once a week. 2. Write to the prompts. 3. Post anytime you want. Next thing that happens, a moderator performs an additional duty. At least one moderator comments to the work with what they thought and how to improve the work. When you post your piece, please make a note that specifies what you want in the feedback. If you want a long, in-depth review, ask for it. If you want no feedback at all, tell us. Other members are asked to comment with feedback, but they are not required to do so. If you want to be a moderator, and take on the duty of helping us give feedback, ask. We'll talk and most likely let you become one. There is a benefit to this - if you're a moderator, you get to help compile the prompts list. 5. Give feedback to the other pieces of writing on the comm, if you want. 6. Become a mod if you want. Finally, spread the word! Let your friends know about this community, so we get more pieces of writing and more feedback and we all have a good time. 1. Be nice. Don't flame anyone. You can be honest in your feedback, but don't be mean. 2. Don't steal anyone's work. 3. Post with this information: title, author, rating, fandom / original, prompt used and what you want the feedback to contain. 4. While we like having the writing posted here, it is not required. Links to it are fine, just as long as you include the header on the post here. No one is required to write - if you do one prompt a week, that's fine. If you do all the prompts all the time, that's fine. Please give feedback, but it's not required. It is nice, though, if you comment to the other pieces of work with something you liked about it. Ask if you have any problems. A good rule of thumb is to list three things that worked and three things that didn't work. Always give a reason why something did or didn't work. Remember to comment on both the large level (narrative arc, characterization, theme) and the small level (grammar, style). zekkass - head mod, creator of comm. ink_n_imp - mod, prompt generator, great inspiration. sporadic__ - mod, maker of the layout! encreindelebile is the French version of this community! thingsunwritten, an original fiction exchange. all_unwritten, a writing community with many prompts. genrechallenge, where you write a story in a genre that's selected every month and then post it. chain_of_fics, where each fanfic begins with the line of the last. thewyrmx, a writing community where you write a story monthly and do the mini-themes as often as you'd like for points. 30_losses, a writing community where you claim a table and write on the subject of loss. 365_themes, a writing community where you write on three-hundred and sixty-five themes. nafiwriwee, a spin off of NaNoWriMo where you write a seven thousand word story in a week. thousandtables, claim a table and write for it. tableaday, claim a table a day and write for them! letter100, claim characters and have them write letters. nospeakingrule, claim characters and write about them with one catch - your character can't speak. To be an affiliate comment here. The Directory of all authors post. There are seven prompts posted every week. Using the most recent set of prompts, write something for each prompt and post all seven pieces before the next set of prompts goes up. Once you have done so, comment on the original prompt post that you used with links to each of the pieces. It doesn't matter if the comment is late, so long as you link to the pieces that were posted in the correct week. The prize for completing this is a banner or LJ icon, whichever one you want. 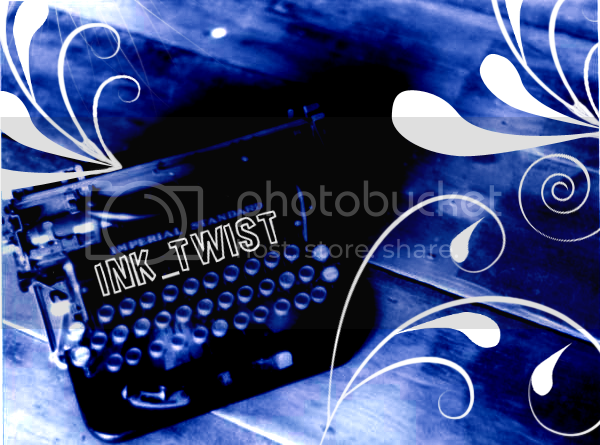 The image will contain your username and the words ink_twist, and it will be themed according to what you wrote. We'd love it if you did such a challenge, and if we got some people doing it a Hall O' Fame might go up, but in the meantime just remember that this is optional and available.